Nice adds Jonathan! 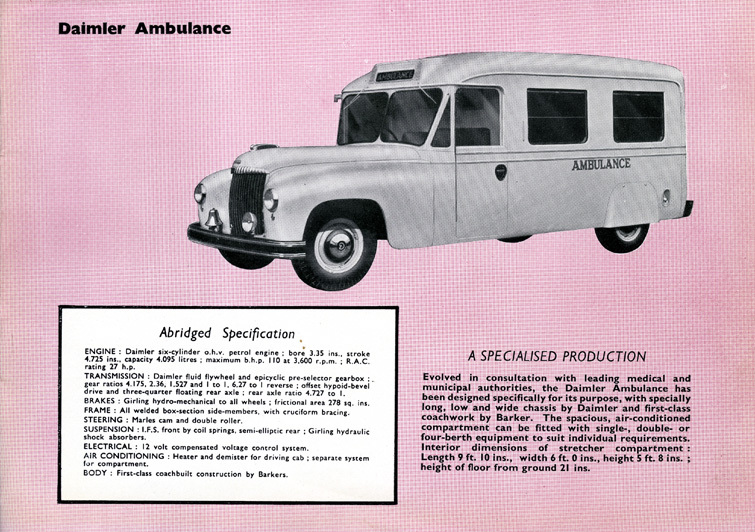 I rather like the Daimler Ambulance in white, instead of the older cream color. I would think white would be a more realistic color. I couldn’t tell from the photo...does that still have the smooth tires, or are they the later treaded type? Terry -- this sample has smooth tires. 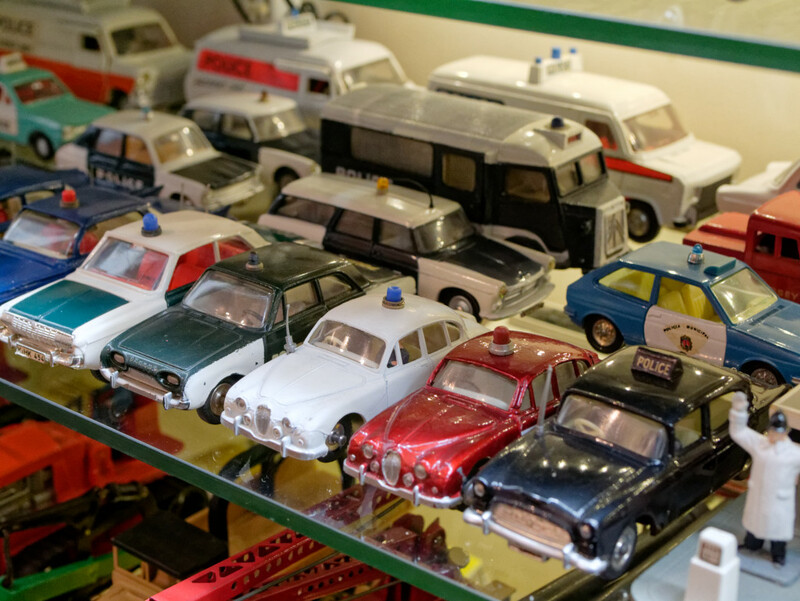 I have collected every Dinky ambulance (though I do not have a prewar one) but I belatedly realized that I didn't have the Daimler, so that had to be rectified. To be honest I never thought this Dinky to be one of their best efforts. If they weren't going to open up the rear windows because of concerns about die wear, they should have at least painted the windows in black or silver. Also the red cross is inaccurate and the rear window spacing is wrong. 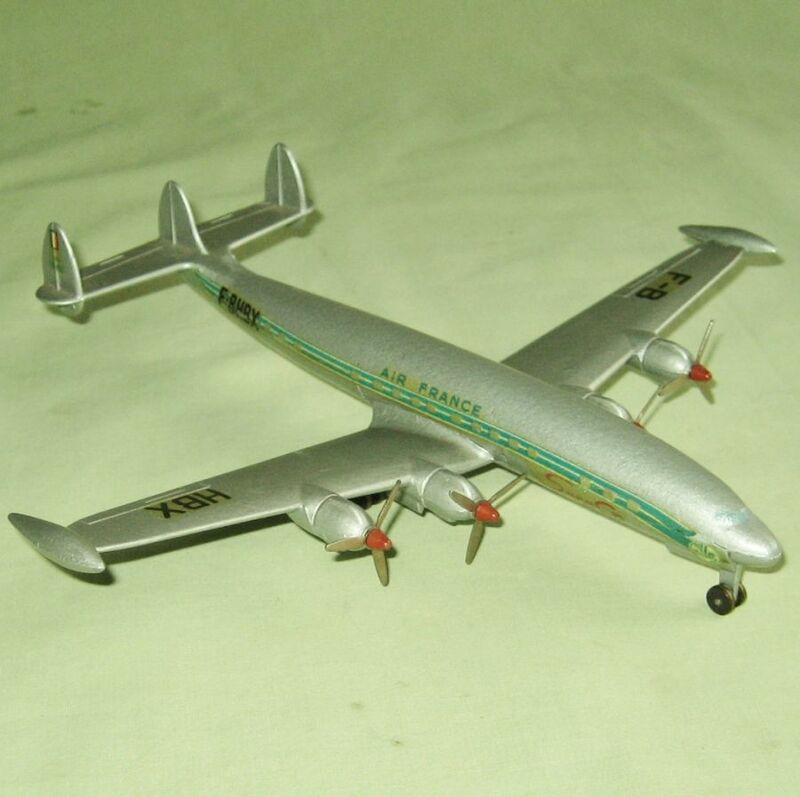 Well, the day had to come -- I think this will be my last Dinky acquisition, at least until I give up on the idea of displaying almost every model I have. Your latest additions are too beautiful to be squeezed Jonathan . All of them look 'as new', untouched. 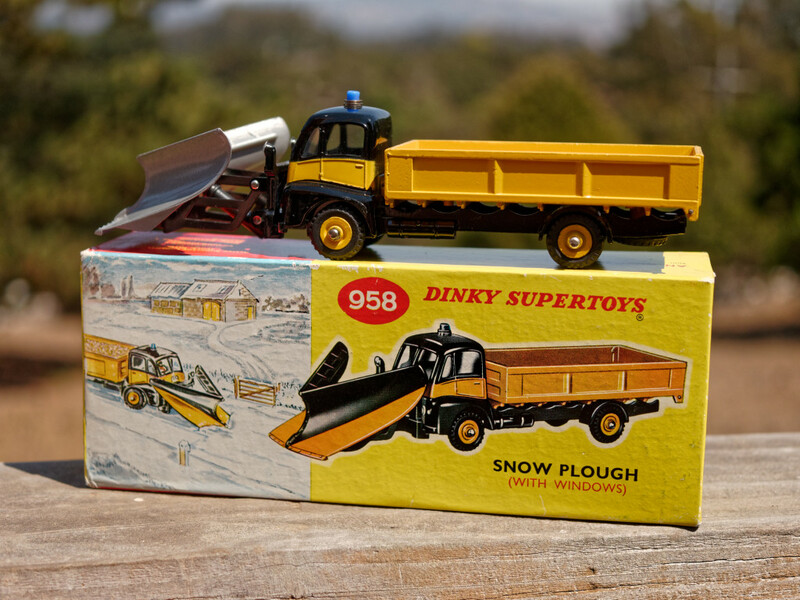 The Snow Plough especially is fine, with the scarcer silver blade and the attractive later box. 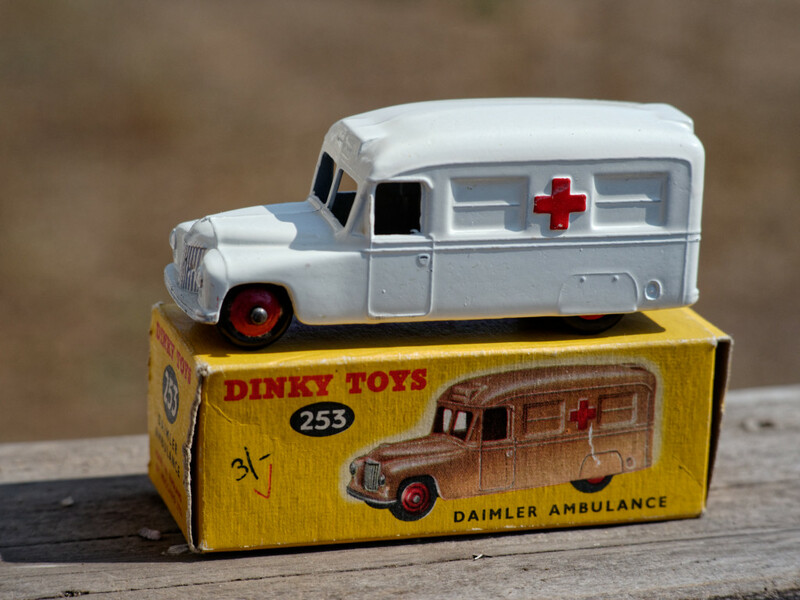 The Daimler model has its shortcomings indeed, but, as an iconic Dinky Toy, we all went to believe that this is how a real ambulance should look like! An addition to my library below. 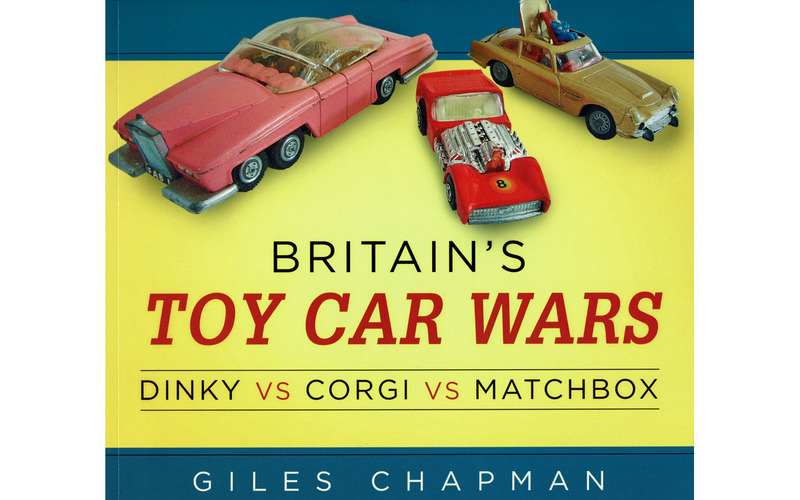 Britain's Toy Car Wars: Dinky vs Corgi vs Matchbox by Giles Chapman. Stroud : The History Press, 2016. Bought in a bookshop in Liverpool and plenty of copies still in stock. Also plenty available on the internet. 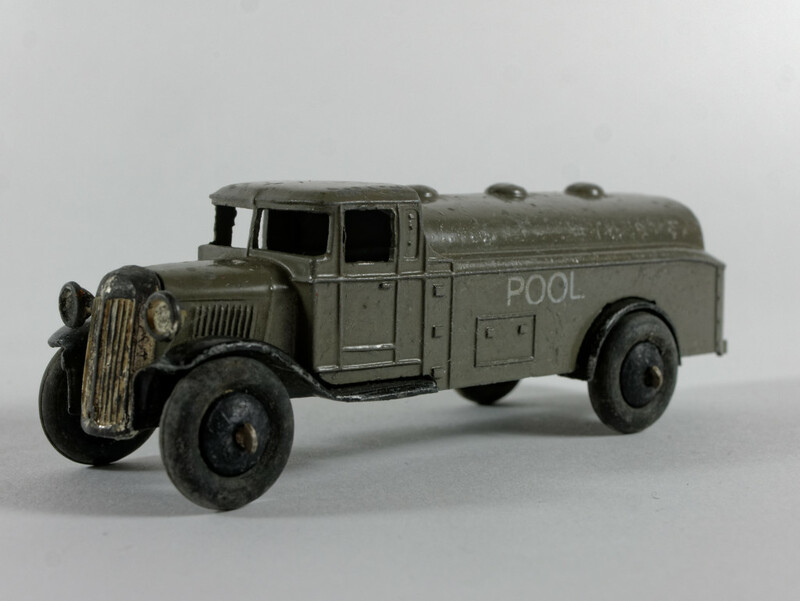 "Diecast-metal Dinky Toys arrived in 1934. 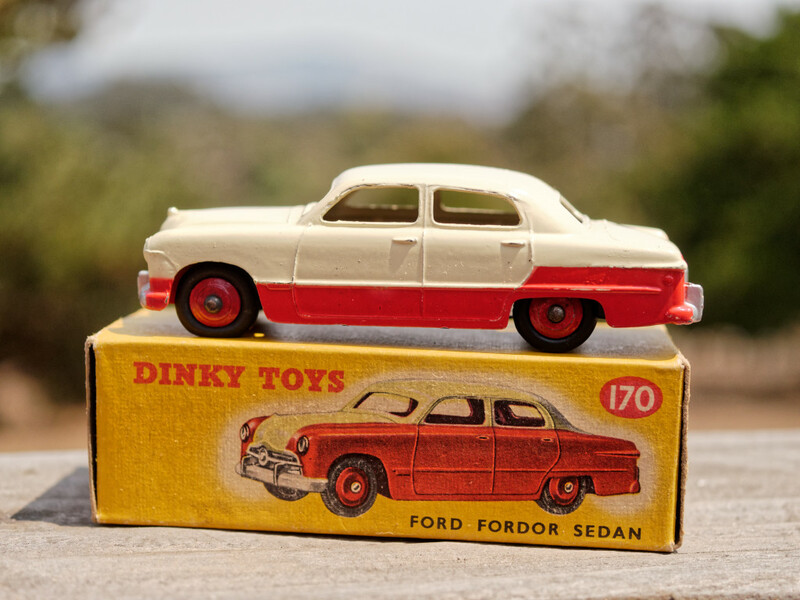 In 1953, Lesney launched the Matchbox series. Mettoy brought its Corgi range in 1956, with working suspension, seats, steering wheels, and opening doors and hoods. 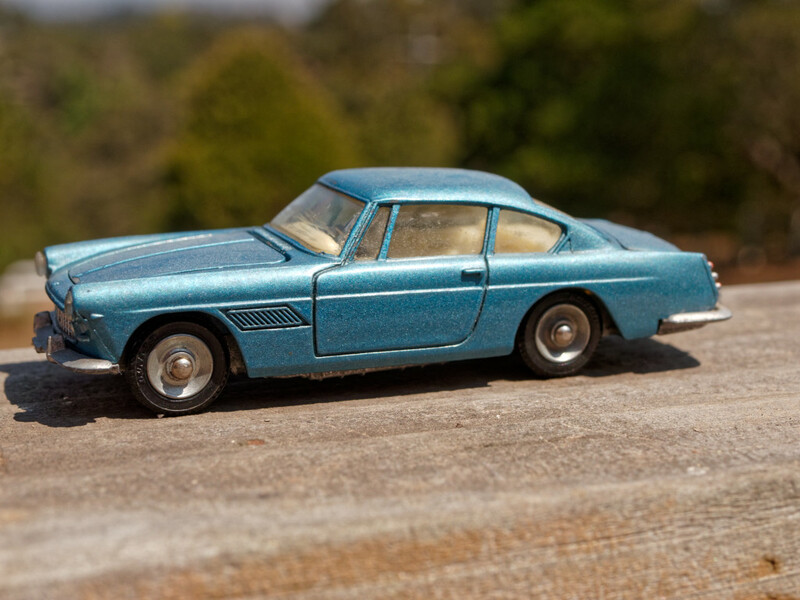 The brand hit the jackpot with its James Bond movie tie-in: a 1:43 scale Aston Martin DB5 with working versions of the on-screen gadgets, including ejector seat. 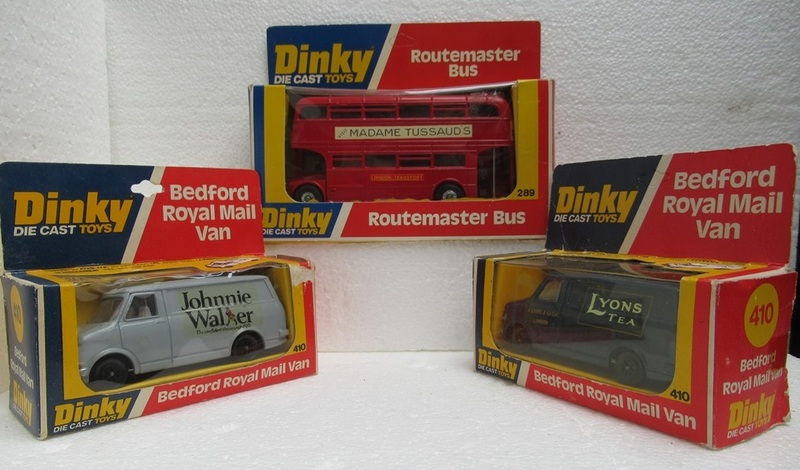 Dinky hit back with models based on Gerry Anderson TV shows. 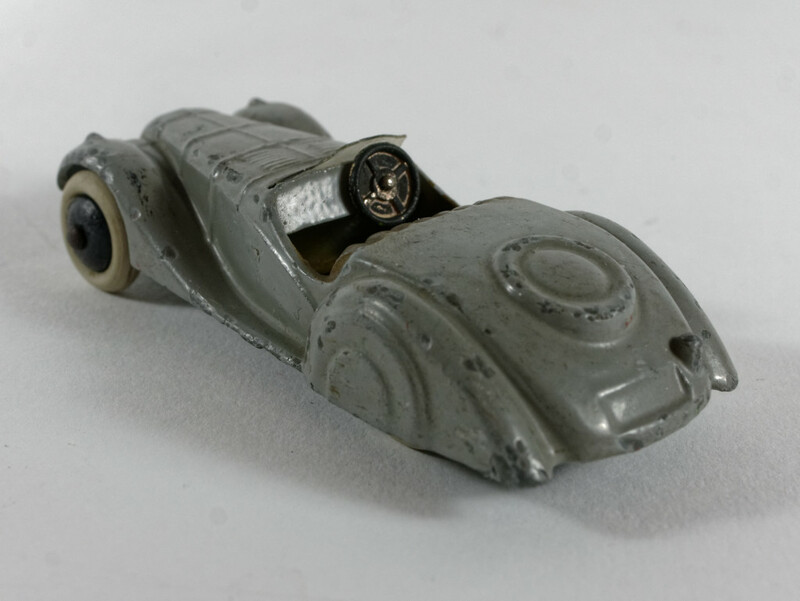 From the U.S. (but made cheaply in Hong Kong), Mattel’s Hot Wheels arrived in 1968. The British establishment was left reeling. 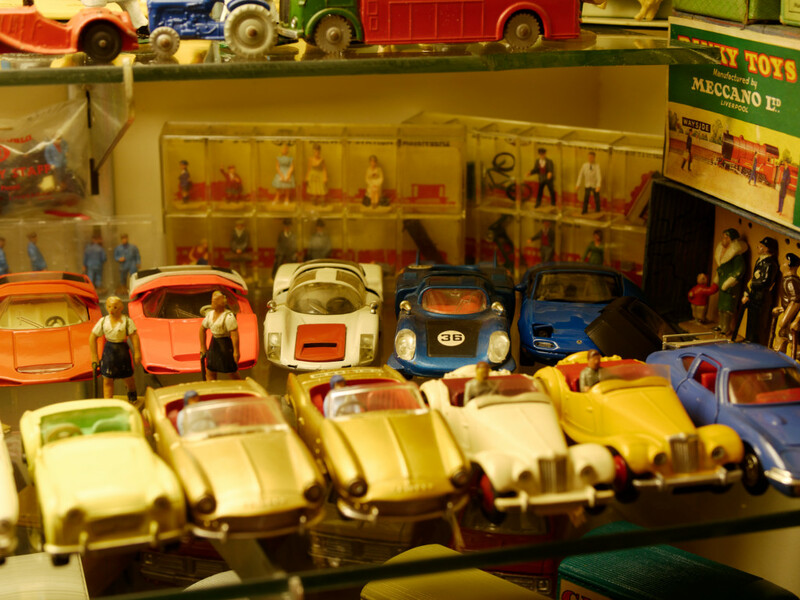 Throughout the 1970s, the nation’s three toy car heroes battled on, trying to alter their offerings so that they offered as much "play value" as possible." Any comment by others? There is a non-Dinky Miata in one picture, which may be subject to eventual banishment -- but it is a model of a full-size car I own, right down to the proper color. Oh, and one can't tell from the photo, but the Snow Plough with the silver blade also has a lighter blue roof beacon than the other version, whose beacon is more of a dark purple. Meanwhile you raise several thoughts. The "Toy Wars" book, which I also have, does succinctly state the impact of Hot Wheels (as well as why I have always disliked Mattel, and decry the fact that they own the Matchbox and Dinky trademarks now). 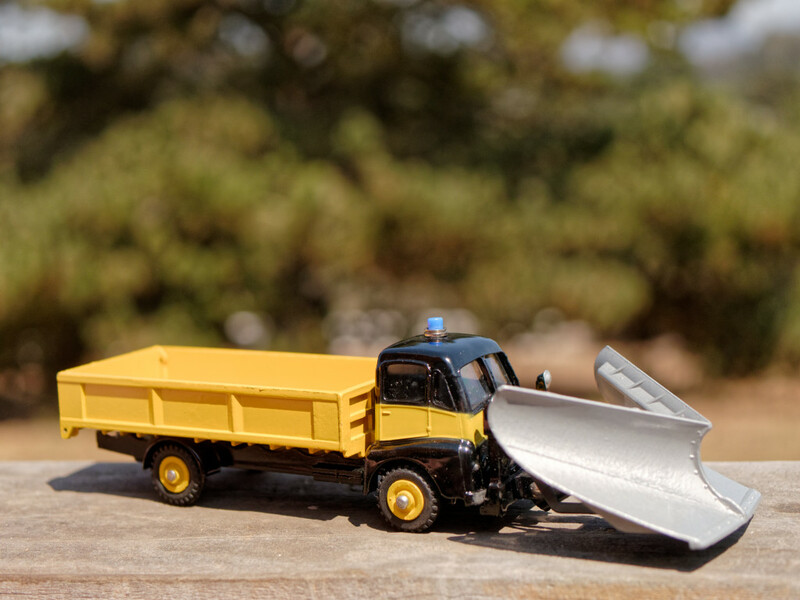 Their unrealistic wheels, colors, and prototypes had a devastating effect on competitors, and while one could argue that these are what children wanted, people want what they are made to want, and Hot Wheels were -- in the U.S., at least -- advertised on television. No rivals could match Mattel's promotional efforts. Secondly, as the author notes, Mattel was the first to move to cheap overseas manufacture in a major way. Regarding the 1001 and 1003 sets, does anyone know whether the 051- and 053-labeled versions came first, or second? I'm guessing second, since the later plastic OO-scale figures (some seen in my photo) have 05x numbering. The parking police has a tough job to do, as I am aware of, seeing your photos. This bus arrived today. The stickers supplied with it by Binns Road were for the Single-Decker Bus, and certainly not appropriate here. I got also a bus this morning with two Bedford van from John Gay production. Johnathan, beautiful police squadron but tell us more about the red Jaguar : is it a Dinky ? Richard -- I've never seen those two particular John Gay models, though as we know, he created a practically endless number of 410 vans, some in bespoke boxes! 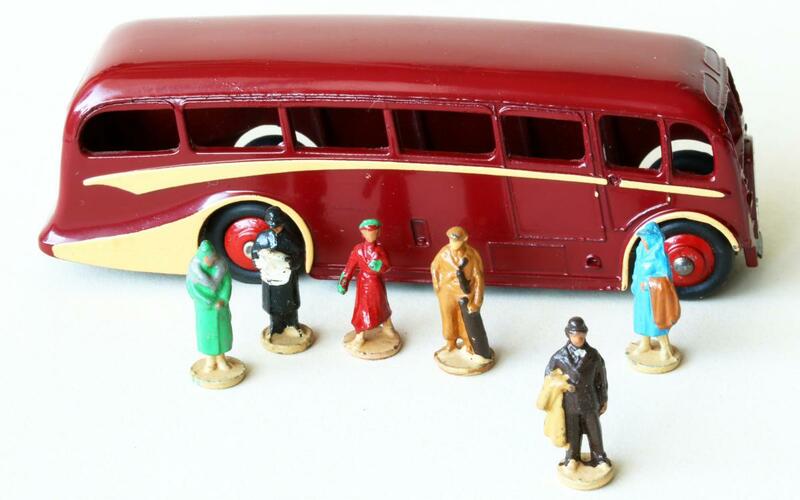 Meanwhile the Routemaster Bus models are a continuing source of confusion to me, specifically in trying to correlate all the different variations with the boxes they came in. Your Tussaud's bus is just like one I have in that it has the diecast wheels and still retains the more detailed casting showing where windows opened, and yet you have the last-type box. 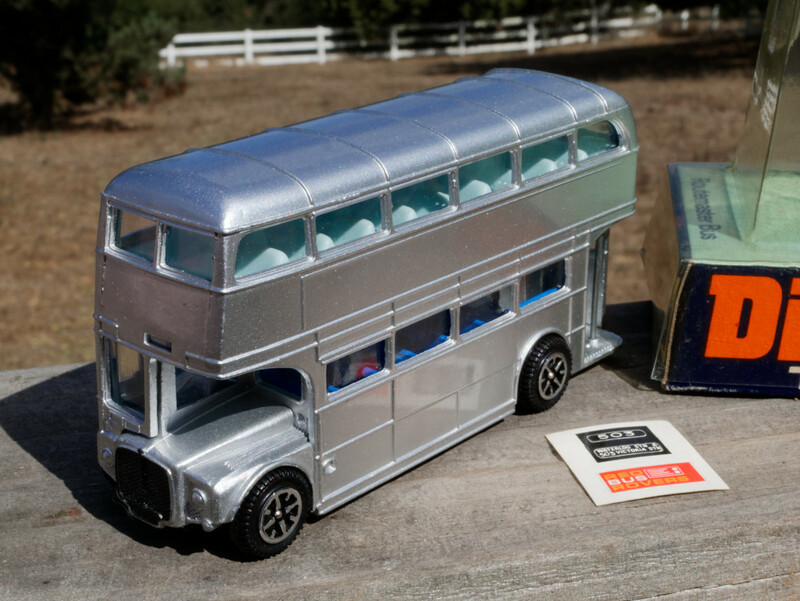 My silver bus has the last-type casting with the horrible Speedwheels, and yet it came with an earilier box. I've seen enough anomalies like this to believe that it was Binns Road itself that mixed up the boxes, rather than it happening after the fact, but I guess we'll never know. The red Jaguar in my police compound is the Nicky version, made in India from Dinky tooling. Behind it one can see another of those anomalies I love, a Pilen Ford Fiesta in police livery. It fits in here because the same Fiesta model was sold in civillian guise as a Dinky Toy. A couple of recent arrivals. 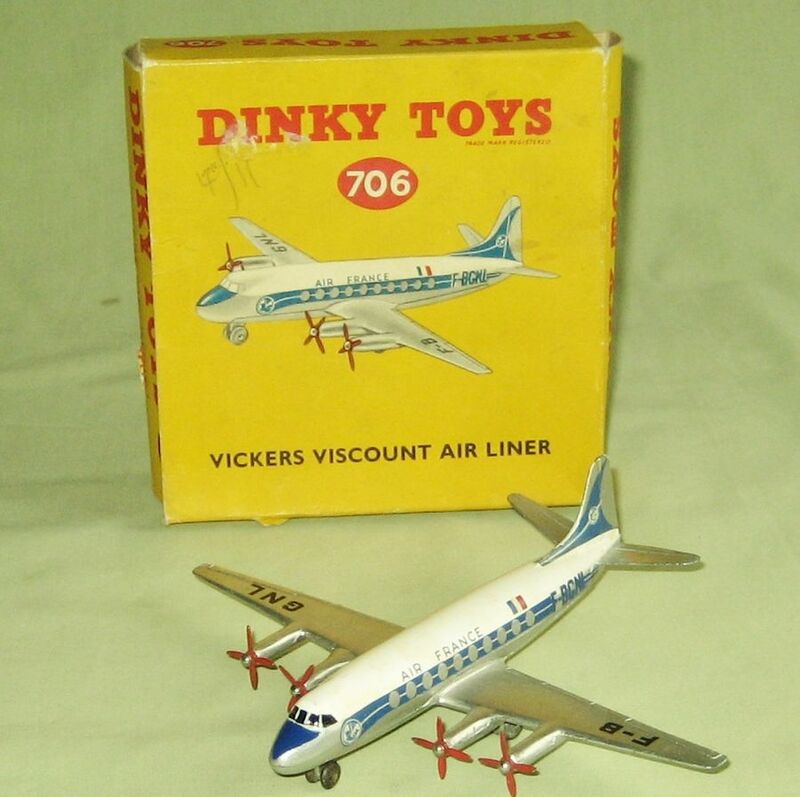 Firstly the Vickers Viscount Airliner 706. 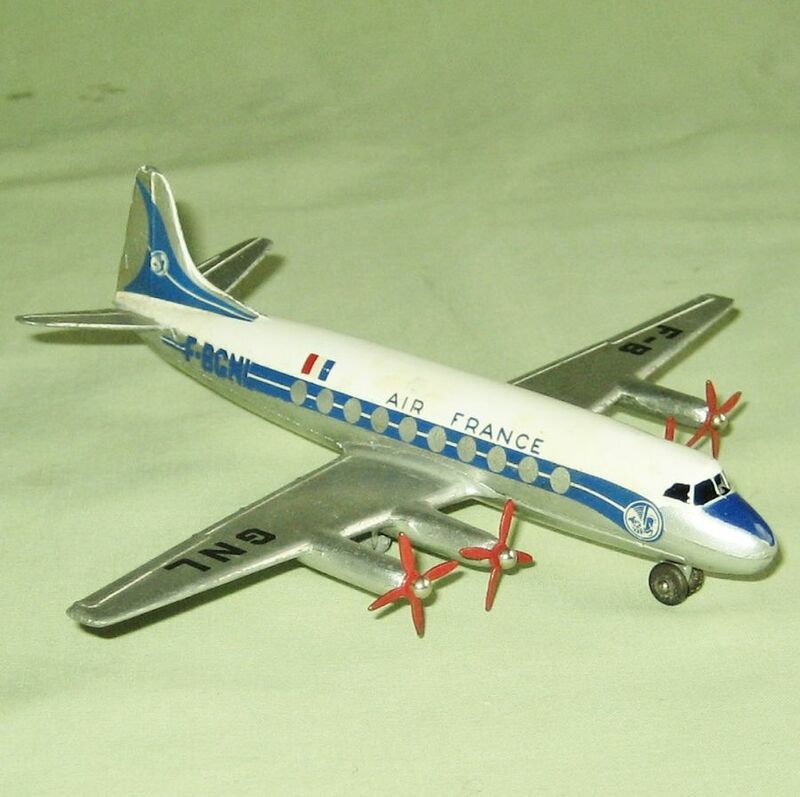 This is the English version of the Air France plane with registration no. F-BGNL. 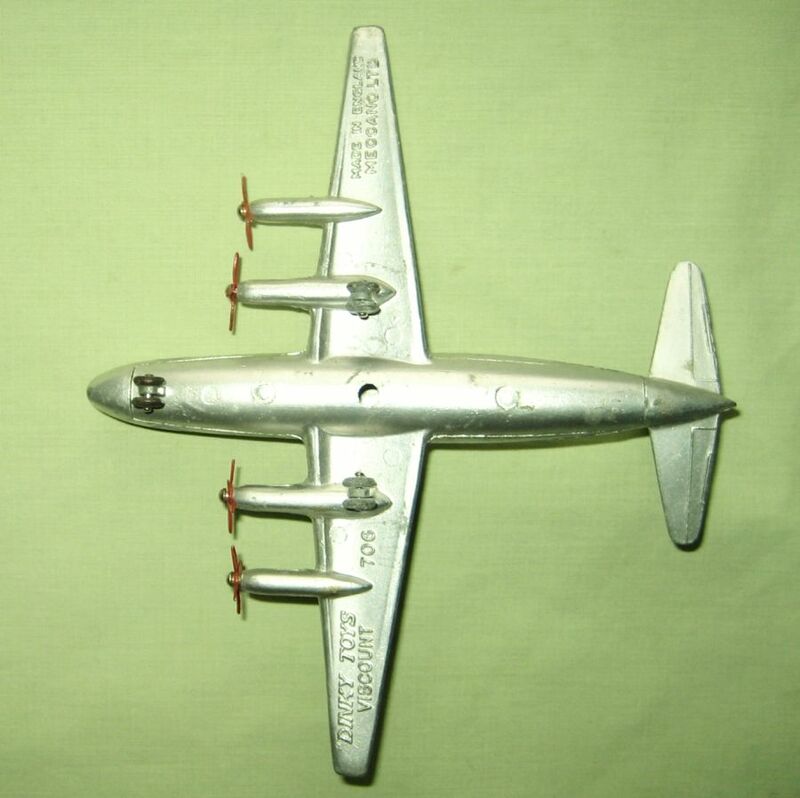 It was the first version and only produced for one year from 1956 to 1957. 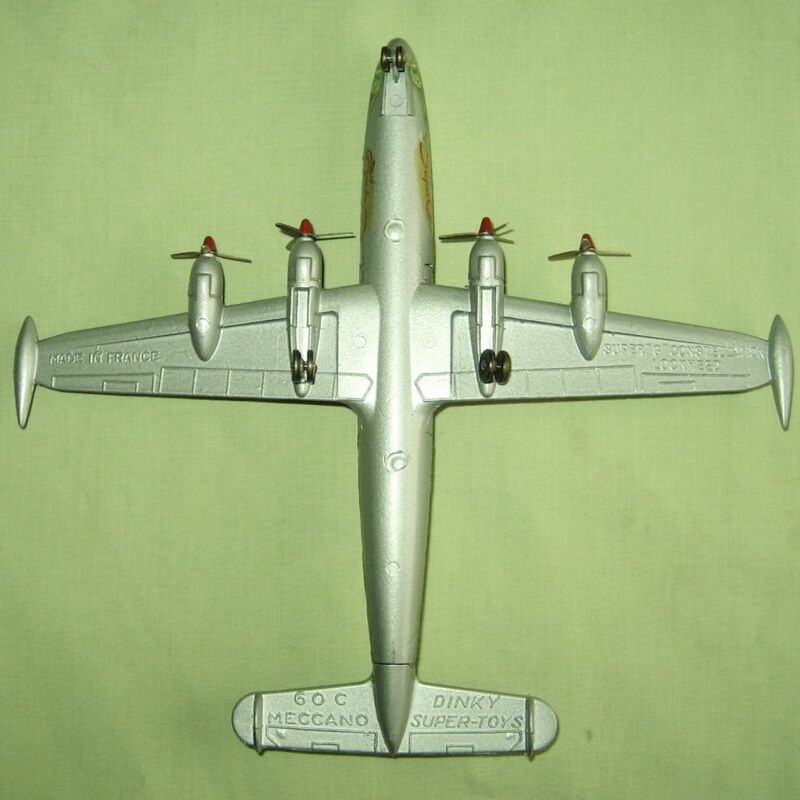 It differs from the French version in not having landing gear doors and other minor details. 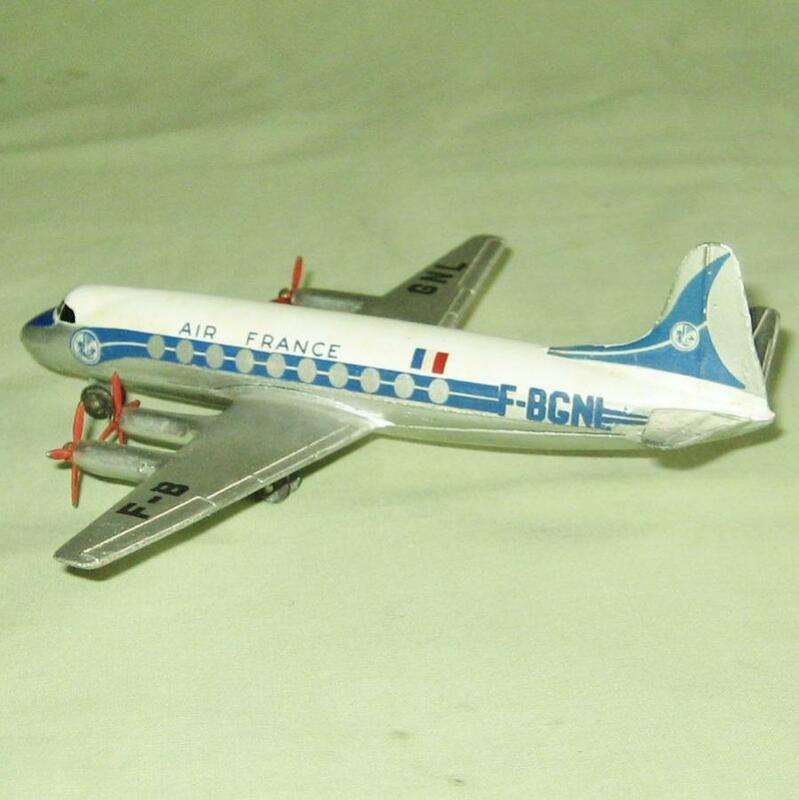 Secondly the French Dinky Supertoys Super G Constellation no. 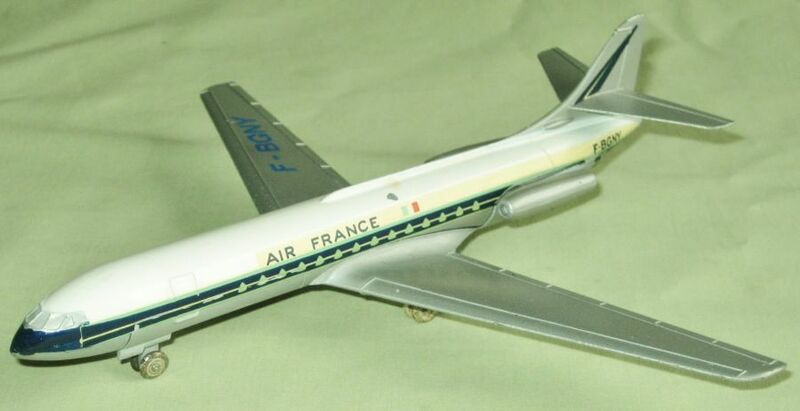 60C with Air France livery and the registration no.F-BHBX. This was made between 1956 to 1963. 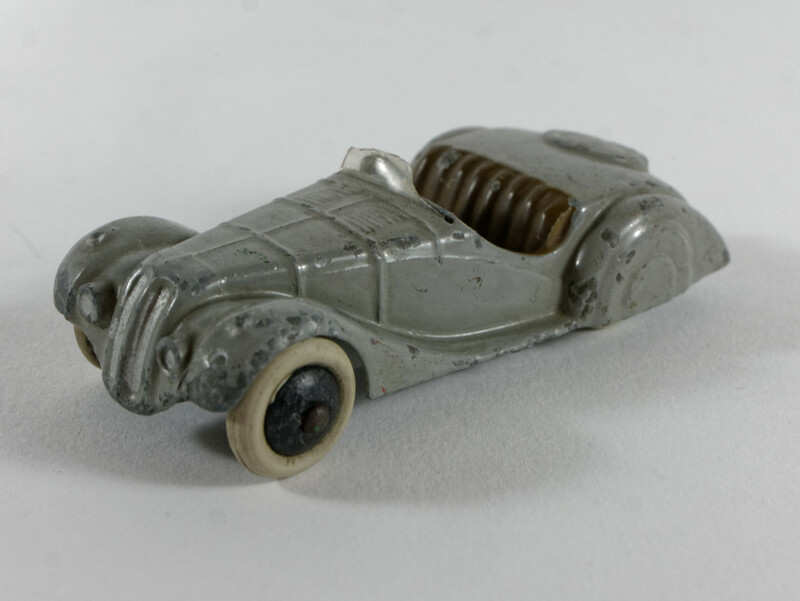 There were, according to Jacques Dujardins CD, Catalogue of Dinky Toys, two versions, one painted grey and one painted silver. Mine appears to be the grey version. 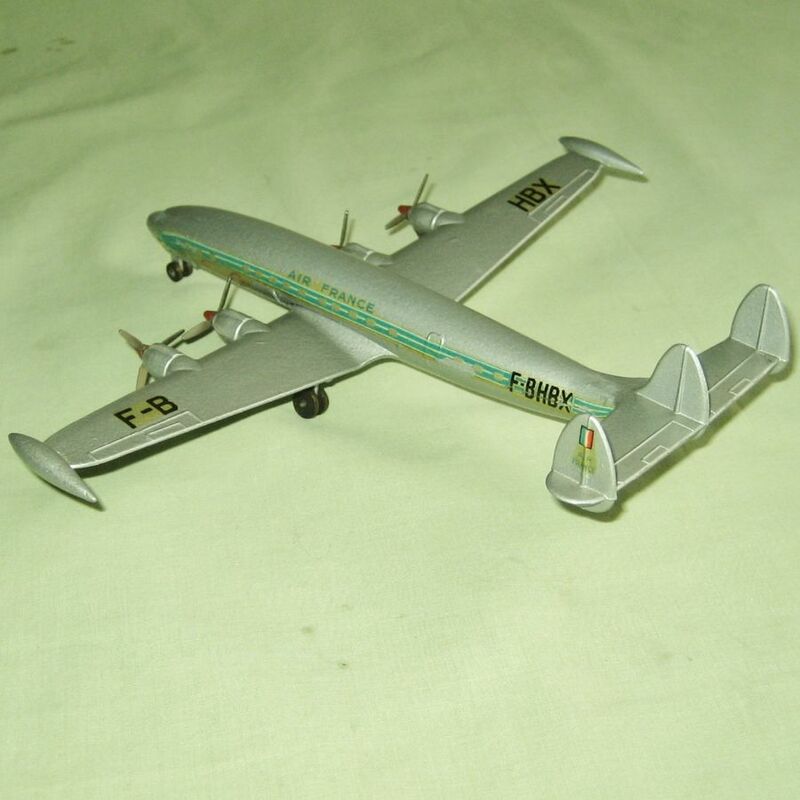 Both planes are in extremely good condition with good boxes. Chris. I like specially the super G.
Indeed, wonderful additions and often difficult to find in this condition. Very special the Jaguar 38f with silver edges on the windshield. Congratulations. Jan, I'm always glad to get tips from our resident master of photography and displays -- speaking of which, I know this is the wrong thread, but I'm amazed at those new signs you made for your displays. I'm amazed that you got the fonts and lettering so perfect, as if they came from Meccano Ltd. itself! 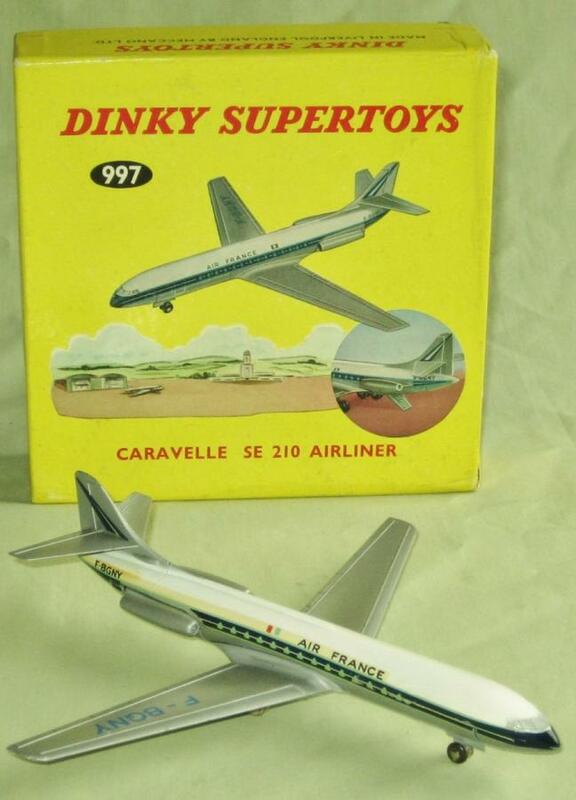 This came a few days ago - a Dinky Supertoys Air France Caravelle SE 210 Airliner. This is the English version which was made between 1962 & 1965. 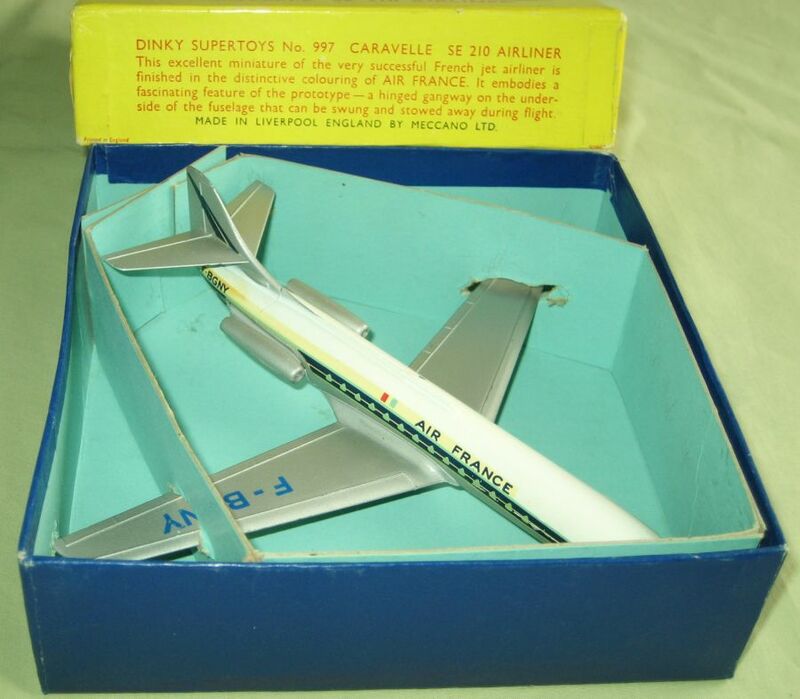 It has the retractable stairs under the tail and also note the words Super Toys under the wing rather than Supertoys.There are quite a few variations with different airlines featured on the fuselage - Air Algerie, Swiss Air, Scandinavian Airlines System and SAS and with different registration numbers. The die apparently went between England & France several times. Rather strangely the windows are slightly triangular rather than round. Nice buy of this jet in good condition. The white wheels are peculiar, are they Dinky Dublo smooth plastic wheels or are they overpainted ? Regarding the wheels, the 8 metal main wheels and one of the front wheels are painted white, though the paint is very worn. The other front wheel is painted black. However I am absolutely sure that they are genuine and have not been tampered with. 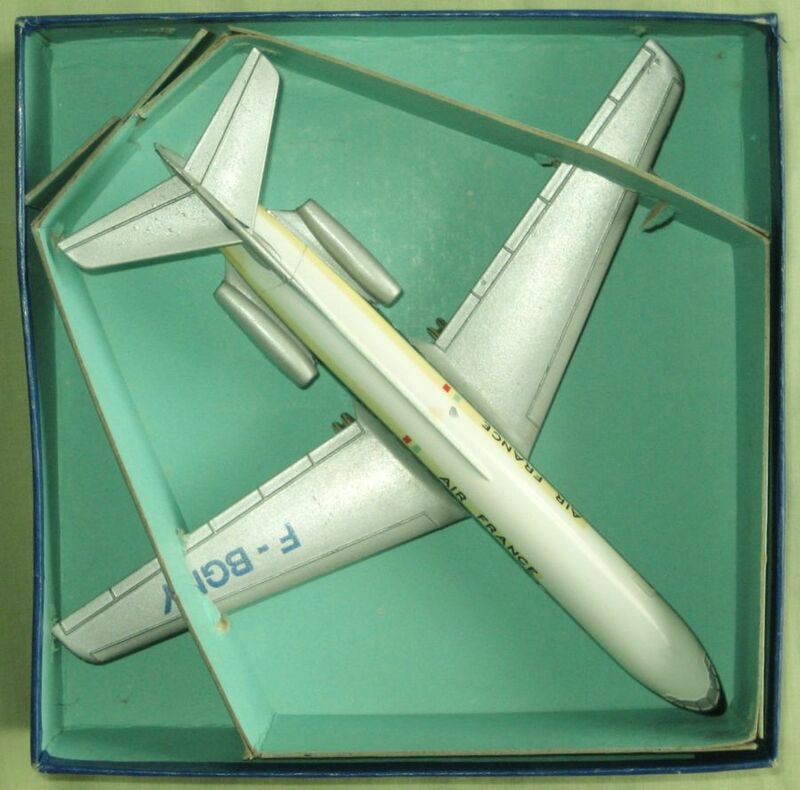 Attached are a couple of photos of the plane in its box with the original packing piece, which I forgot to put in my original post. A wonderful example, complete with box insert! 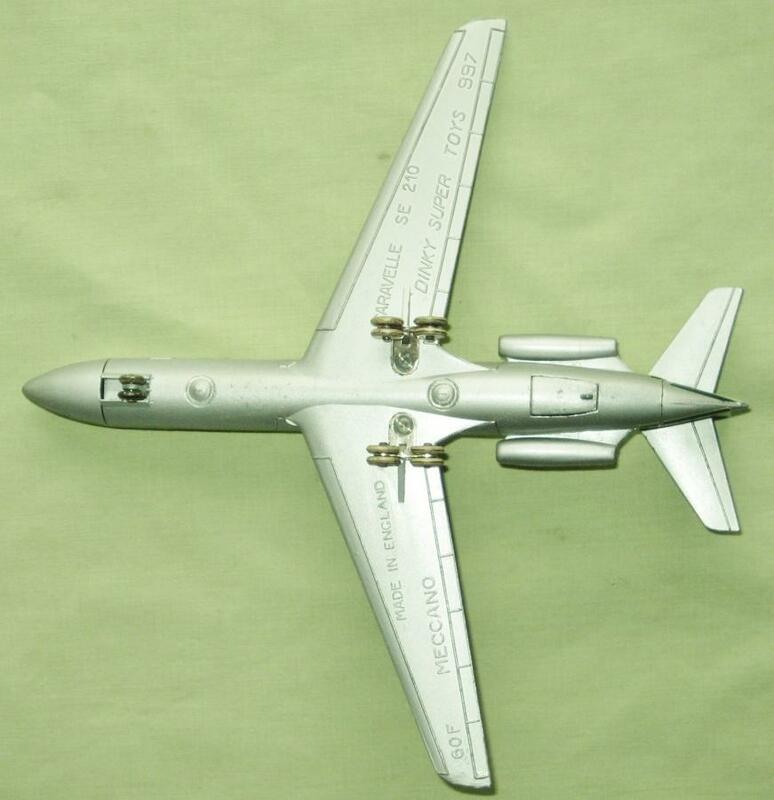 I made an effort to gather some comparative remarks and pictures some time ago, in the British Aircraft > 997 thread. I recently received this extremely rare gift set from an eBay seller (unfortunately, the price was not $3.95). I have only ever seen two others, via searching past Vectis auctions. 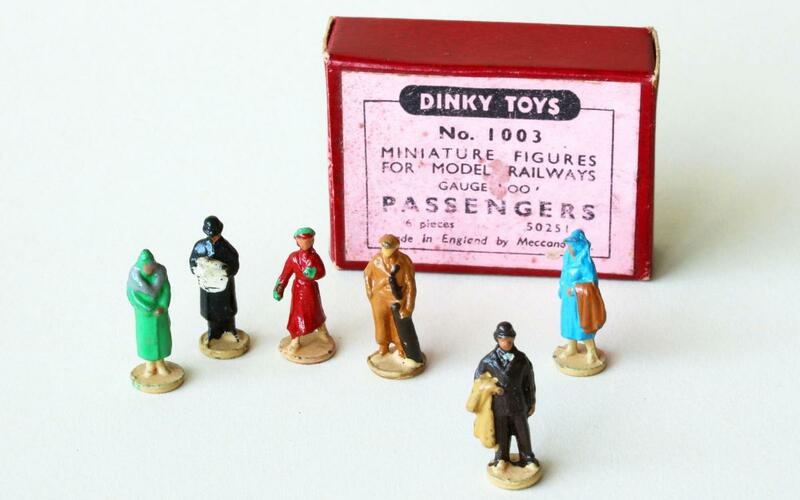 I imagine it is as uncommon as prewar Dinky sets, and in fact it has something in common with them, as we will see. 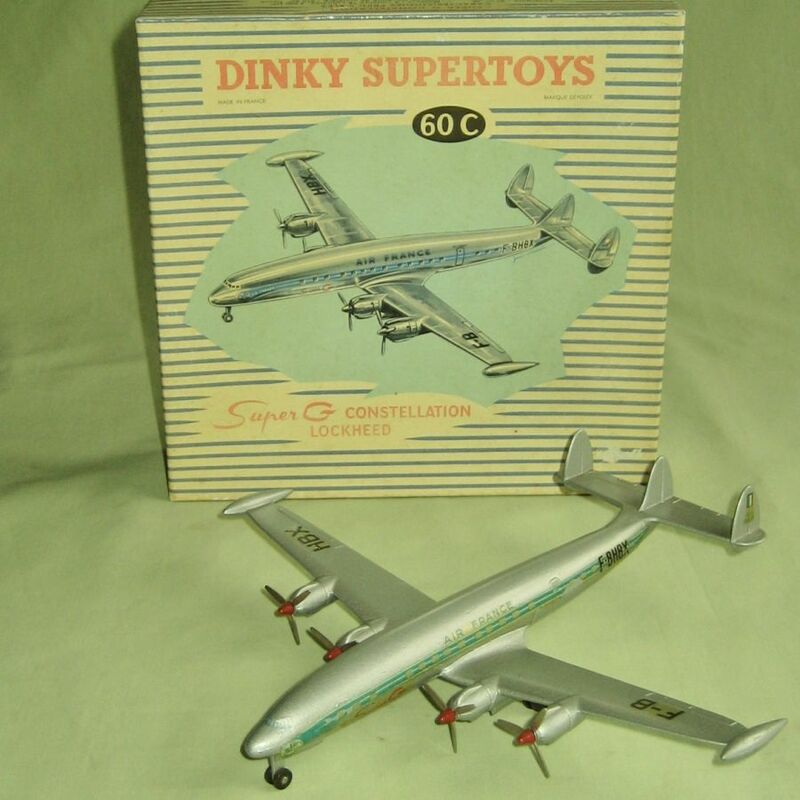 I pose the question of whether these are the worst ever Dinky Toys, but there is also the question of whether they can be considered Dinky Toys at all. While sold by Meccano Ltd., the Mini-Dinky range was designed by Lines Brothers in Merton, London* and had nothing to do with Binns Road. While separate leaflets advertising them were published, they were never included in a Dinky catalogue as far as I know. 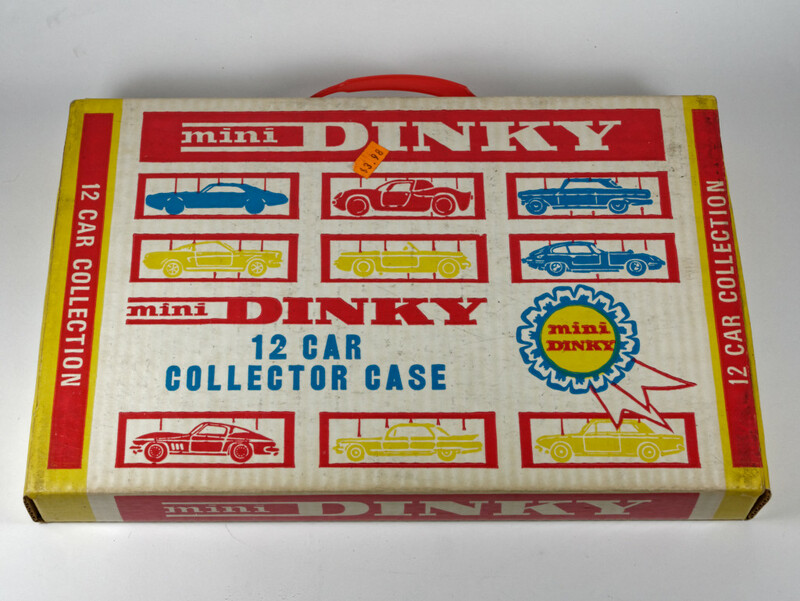 Appearing in 1967, the Mini-Dinkys were produced in Hong Kong. 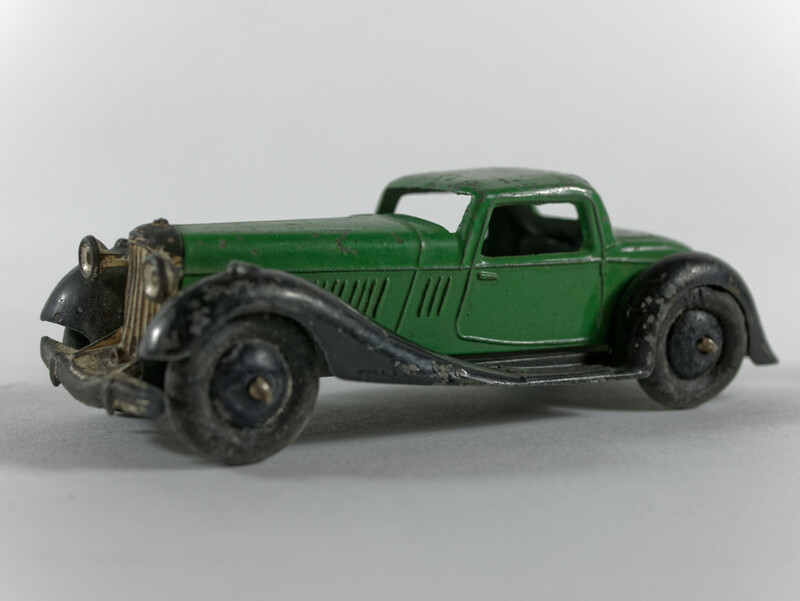 The moulds were well-designed and the models came in attractive (though flimsy) plastic garages, but the paintwork was mostly drab, wheels tended to come off, and -- worst of all -- many of the castings tended to suffer from metal fatigue. This sometimes manifested itself before the toys had even left the shops, although that could be a while since the range did not sell well. 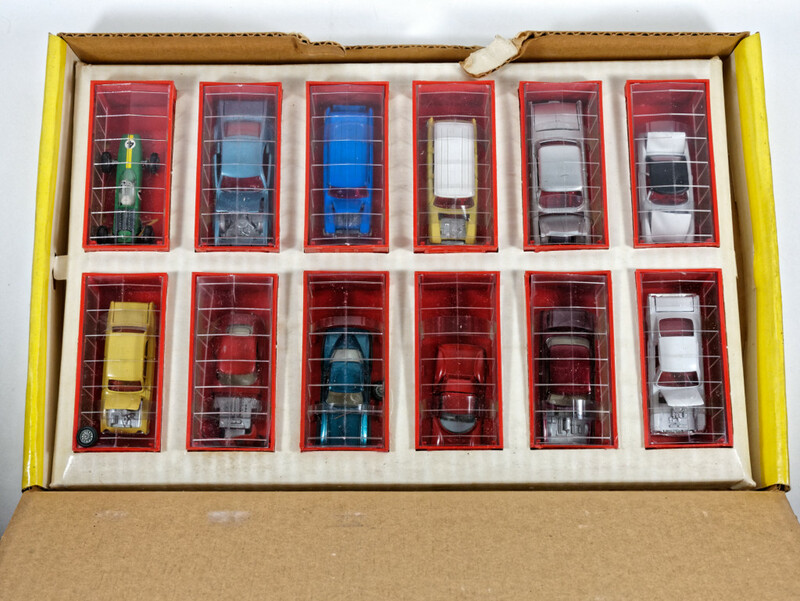 How Lines Brothers thought these toys could compete with much-more-attractive-and-sturdy Matchboxes or Hot Wheels is a mystery. When the toys were "deleted" is hard to say, given slow sales. 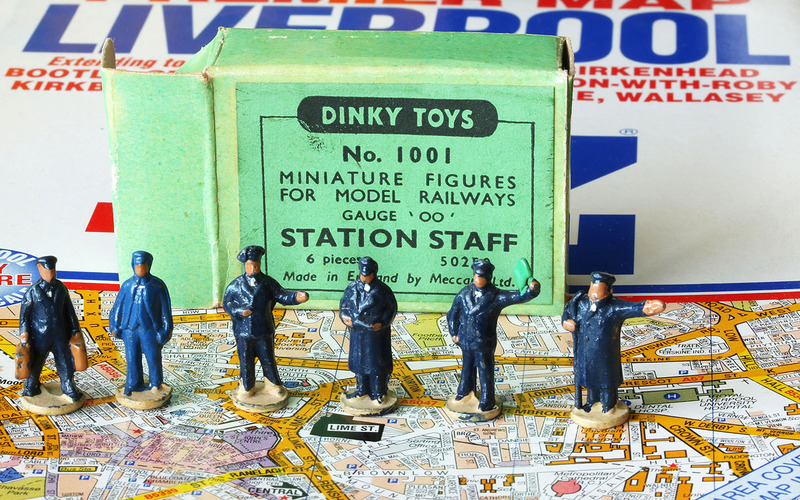 I recall buying several Mini-Dinky models at London souvenir stands in 1972, but they may have been old stock. Meanwhile, various 1967-model cars (Rambler, Camaro, etc.) were made by Mini-Dinky in prototype form but not issued, suggesting the plug had been pulled on this range pretty quickly. As an aside, as well as passenger cars, the Mini-Dinky range also included construction vehicles, via moulds previously used by Mercury in the USA (and later to be issued under other brands), and several Formula One racers made by Best Box in Holland. 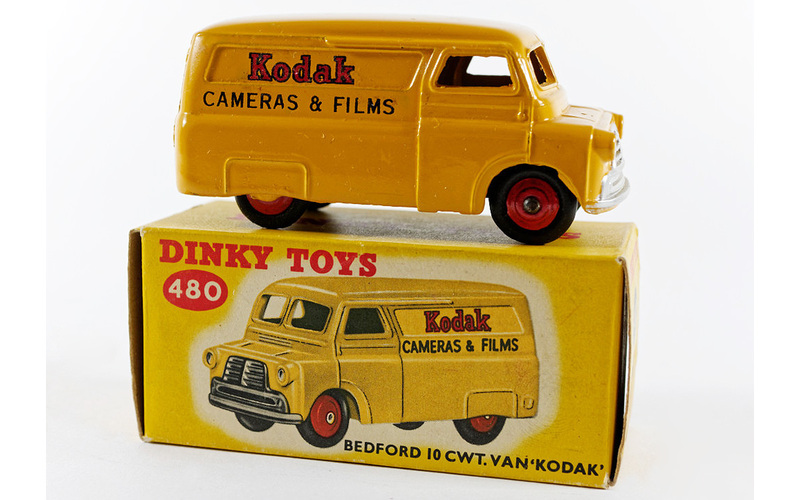 Underlining Mini-Dinky's second-class status, these toys were often sold by retailers that did not have regular Dinky Toys. 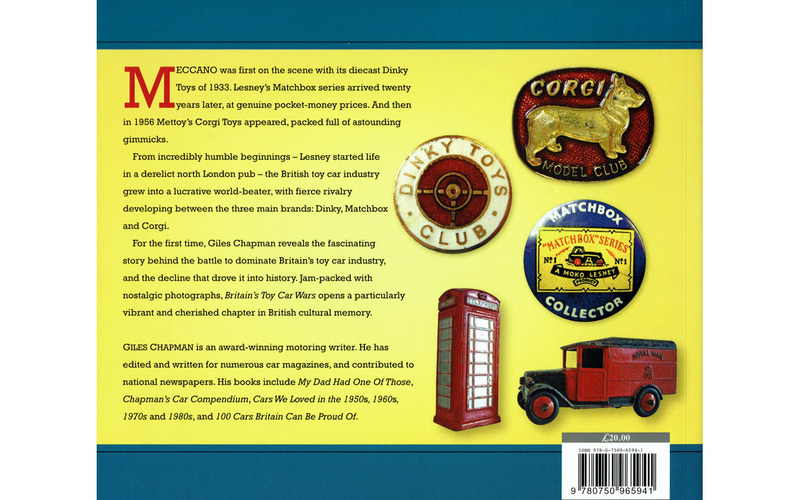 (Perhaps UK readers can comment on whether they ever saw Mini-Dinky and Dinky Toys together in the same shop.) I've already mentioned purchasing some of the models in a London souvenir shop. 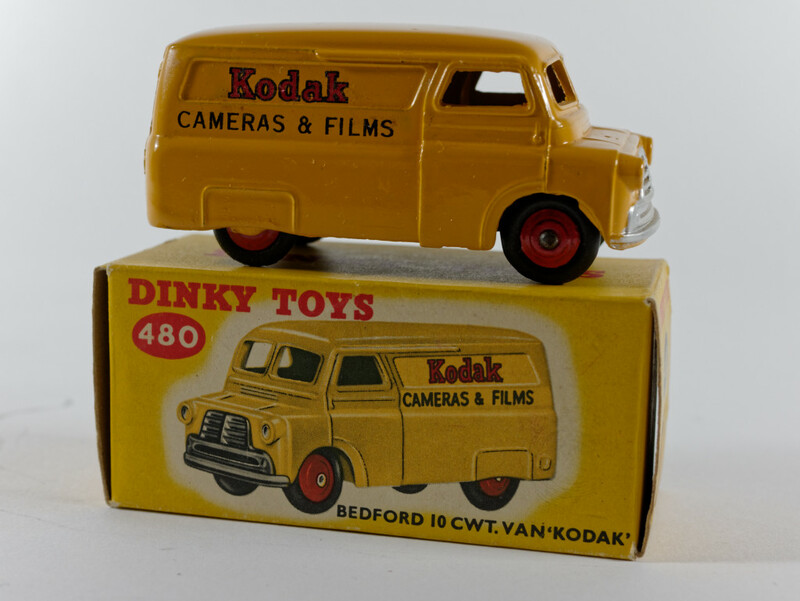 Here in California, they tantalizingly appeared in a Palo Alto hobby shop at a time when my best friend and I were unable to purchase the real Dinky Toys we wanted. 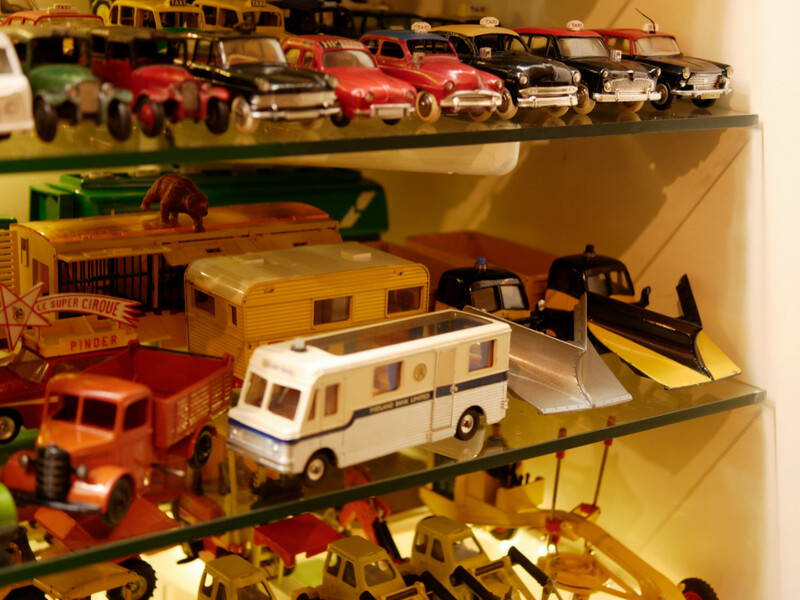 Naturally we quizzed the proprietor, and she reported that her distributor had no other Dinky Toys, only these. So I purchased various samples as a curiosity, even if they were always pretty disappointing for the reasons I've mentioned. As for the present gift set, I never saw it at the time, but they obviously existed in small quantities. 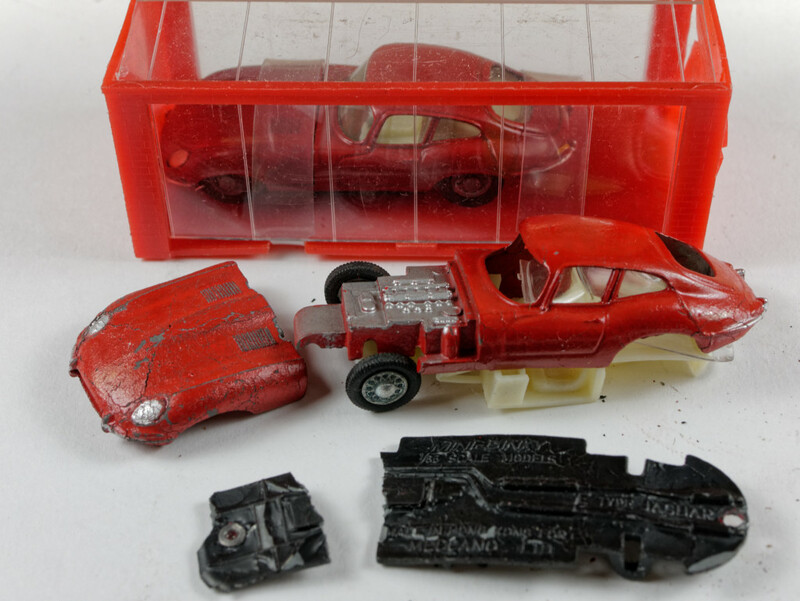 *Several years ago, an eBay user "ziggystardust" acquired a quantity of drawings, test castings, and pre-production Mini-Dinky models from a former Lines Brothers designer. These were unfortunately dispersed, auctioned off to a variety of different buyers. A similar set has been sold on eBay on September 8, 2007 for £ 171. Very much more expensive in 2018, though another of these sets sold for £620 at Vectis in 2006. A foolish purchase, perhaps, but I do think history is proving how rare the set is. Mind you, the contents of the cardboard case could probably be assembled separately for £300 or so! Jan—More wonderful acquisitions.....and I really like those early post war versions. They are usually free of the fatigue often present in their pre-war brothers, but still retain much of the charm, such as those finely treaded white tires and smooth wheels. I also like having those open windows. Very nice Taxi too. Has anyone ever really concluded why the English Meccano factory chose to close all those small windows? Their French counterparts kept their open windows. I have heard theories about less flash issues, but that doesn’t seem to likely when you look at all the other open windows still there.....just curious!